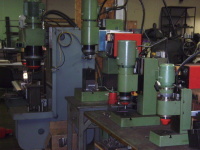 We have a full line of riveting machines at our Rochester facility. These machines are primarily used for running samples for our customers prior to purchasing any equipment or tools. 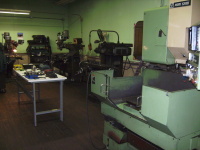 We also use these machines for developing special fixtures and tools for riveting and staking. 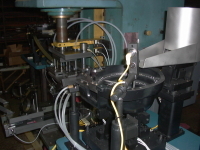 We can also run production quantities if you would like to outsource your riveting operations. 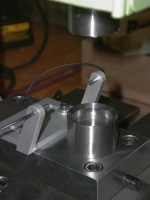 We have designed and built hundreds of fixtures and tools for numerous applications and industries. We also stock the more general riveting peins. The picture to the near right shows a turn key machine for riveting hinges. 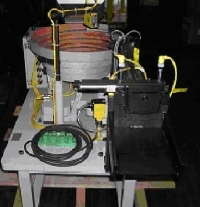 This machine utilized a BalTec (Bracker) RN281 table top radial riveter. HS Assembly engineered and manufactured the fixture and riveting tool to rivet four different style hinges. Quick change out inserts were utilized to accommodate the different style hinges. Both ends of the hinge are being riveted utilizing this machine. 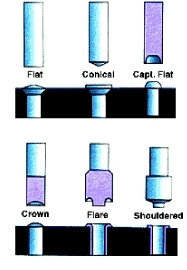 The picture far right shows a fixture on a BalTec RN-281 for riveting terminal posts. 12 different styles were accommodated utilizing quick change out inserts. The far right fixture rivets 3 rivets utilizing a circular “lock” configuration for the assembly of a latch stand. 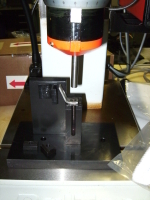 This fixture was integrated to a BalTec RN-331 Riveting Machine. 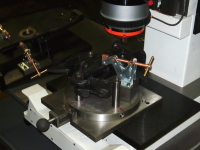 We realize that some applications require special tooling when purchasing "off the shelf" machinery. That is how our "Value Added Services" can help in assuring that you get exactly what is needed for your specific application. Although our "Value Added Services" work primarily in conjunction with our Distribution Division, we can work on any piece of machinery from re-furbishing machines to adding special features such as fixturing and tooling. At HS Assembly Inc we have both a Manufacturing facility along with experienced engineers that can help in providing a "turn key" solution. If you are a machine builder, let our engineers help by utilizing our expertise in the product lines we represent. 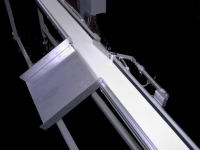 Machine Refurbishment – We also refurbish assembly machinery including riveting machines, custom assembly machinery, conveyors, automatic part feeders and automatic screwdrivers. Recently, we refurbished a 20 year old dial Bracker riveting machine. We first evaluated the condition of the machine and made our recommendations. We replaced the worn components within the riveting machine. We then provided fixtures to the dial for the new part being manufactured. We also provided a new riveting pein, and added an air "blow-off" for part ejection. Quick change out fixtures were designed so that the machine could be easily changed over to run the old part. If you have an old riveting machine (manufactured by Bracker or HSH) that needs to be re-tooled or refurbished, give us a call. This press was refurbished with new feeder bowls, tooling and fixtures. The pins are now automatically fed into the assembly and the pressing operation is sequenced once all 4 pins are in place.